Extra Router Safety Made Simple! Capture larger parts between dual fences on this large size coping sled. The secondary control handle provides extra control while performing end grain rail cuts. 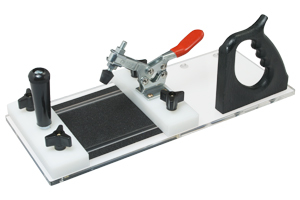 The 500 lb clamp holds your work piece securely between the dual fences. A friction strip resists part movement during routing. The ergonomically designed primary handle provides comfort and gives excellent control of the sled as you push it past the cutter. 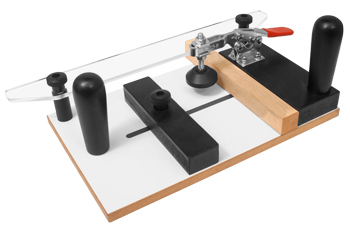 A replaceable backer block prevents blow out as the cutter exits the wood. Excellent for holding small parts requiring routed edges. Polyethylene and acrylic construction for durability and rigidity.